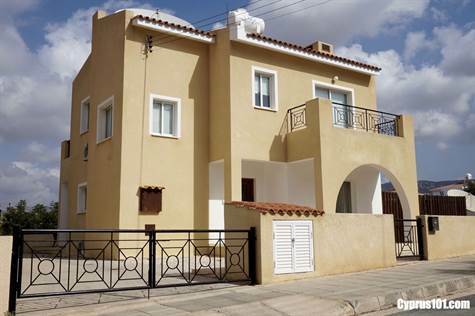 Kissonerga Villa, Paphos – This well presented 2 bedroom detached villa is situated on a corner plot. The home is in a quiet residential area in the traditional village of Kissonerga. The local village amenities include a good range of restaurants and shops and are all within easy walking distance. Paphos Town is a 5 minute drive away and it’s a relaxed 15 to 20 minute walk to the local beach. The ground floor accommodation features lots of space with an entrance hallway, guest toilet, fully fitted kitchen/diner and a spacious living room with central open fireplace. There open plan living room / kitchen are nicely separated by decorative archways. Upstairs are two large double bedrooms with en-suite facilities and private balconies. The master bedroom has a walk-in dressing area and en-suite shower room and the second bedroom, an en-suite bathroom. The views to the front of the property are of the well established residential area and to the rear are stunning rural mountain views. There is easy access to the rear outdoor space from both the living room and kitchen. Two seating areas on each side of the swimming pool are ideal for outdoor dining and relaxing. The pool has roman steps for easy access and the rural views can be enjoyed also from this level. To the side is a driveway with parking for at least two cars and there is a further garden area and covered patio to the front. Although currently utilised as a holiday home, the property is perfect for permanent use also. It come fully furnished with title deeds.